I’ve evolved as a clinician more so in my approach to people than in my accumulation of techniques. I went from wanting to fix people to wanting to connect with them. Let's take a quick trip back in time to one of my first patient experiences. This was years ago. Before I get into the patient experience, let me paint a little picture of how I got to this clinic. I accepted a job at this clinic months before graduation. While I was in my last year of physical therapy school I went through a year long advanced training program. This program consisted of learning how to diagnose and treat a multitude of musculoskeletal issues. I learned how to access and manipulate (see:crack) any joint in the body. Then I practiced. And practiced. And for good measure, practiced some more. I was ready to fix people. I was eager to start working. To prove myself to my colleagues and to myself. The way it worked was we would see patients on our schedule, and read about their situation. At that time we were transitioning from paper files to digital ones. So, it was either a folder or a digital file. I'd grab the folder and read the information that was already filled out by the patient. Which brings us to Mary (not her real name). She came in with low back pain. A very common problem. In fact, the most common problem. I read the file. Grabbed my folder and went to call her from the waiting room. I saw through the glass window that separated the treatment area from the waiting area, a very uncomfortable young woman. She was shifting and moving in her seat. No position seemed comfortable. It seemed as if the chair was her worst enemy with no intention of losing the battle they were in. I called her name and introduced myself. She seemed very eager to meet me, in retrospect she was most likely eager to stand. We walked back to the treatment room to begin the initial evaluation. Every initial evaluation begins with the subjective part. That is when the clinician asks specific questions to get all the pieces of the puzzle on the table. This is a critical part of the exam. By the end of the subjective, a clinician should have a pretty good idea of what's going on. Mary had been suffering from low back pain for several months. It progressed from an annoyance to debilitating. She had seen a few other clinicians, and unfortunately, nothing had worked. As I look back on this conversation I'm struck by her answers. At the time I was more focused on her symptoms. I wanted to get to the source of her pain. After all, I had recently completed a challenging, and all-encompassing year-long course. Her symptoms were like ones I've learned. So, of course, I must know a technique that will fix her. At that time, I needed to figure out what that technique was. As she described her problem, despair was predominant in her answers. Instead of saying, "I'm looking forward to jogging again,” she would say, "I'm afraid to walk because it will hurt." Her perspective became of how not to get worse, instead of believing she could get better. I finished the subjective assessment and decided that she would benefit from a spinal manipulation (see: back crack). I explained to her what I was going to do and why I thought it would benefit her. She agreed, as most patients do because they trust their clinician. I asked her to lie down on the table, which she did. As the final crunches of the paper covering the table quieted down I asked her if she was ready. She said yes. I bent her knee, rotated her back, and applied a quick downward motion on her low back. A single audible pop from her low back was heard. I mentally high fived myself. Nailed it. Success. I walked away from the table and asked her to stand up to see how she feels. I went to jot down a few notes about the treatment. I heard the paper crinkling as she stood. Then I heard a sound I did not expect. Sobs. I put my pen down, turned to see Mary crying. Maybe the mental high five was a bit premature. I began to run through various possibilities in my mind. Did I hurt her? Was I wrong in my assessment? What did I miss? If you are noticing that a lot of my early questions were about me and not her you are not wrong. So after about 10 seconds which seemed like 10 minutes, I finally asked, "what's going on, are you ok?" Her response "Yes, I don't know why I'm crying it's just that I don't have pain right now." Again, not something that I was expecting. We discussed that it's normal to experience an emotional release. She moved around a bit more, tried sitting and finally finished with a few exercises. She felt better. I felt completely confused, and yet happy that I helped her. She came in for 4 more visits over a span of 4 weeks and finished feeling a lot better. So why does this encounter with Mary stick out so much for me? All in all, it seems like success, right? She came in with pain, I treated her, she felt better and left. The problem was I fed my bias that it was my technique that helped her. I wanted that technique to help her. I believed it would. Did it have a role to play? Absolutely. And yet, as I treated thousands more patients I began to see things very differently. In looking back at Mary and another case that I'll finish out this post with shortly, I realized it was not the technique that helped her. It was the permission to move. Anchors of uncertainty and fear were holding Mary down. She, like thousands of others that I treated, was afraid of what pain would limit her from. Afraid of what they wouldn't be able to do anymore. Afraid of not knowing what a future without control of their bodies would hold. I thought my spinal manipulation helped Mary. In actuality, I helped her by showing her that it was possible to live without pain again and it was ok to move. Over the last few years, I've focused a lot of my research and reading on behavioral psychology. I've spent less time on clinical practice and more time on business. Recently, my mom called and asked if I could help one of her friends. He began experiencing back pain. Of course, I'd help I told her. We got in touch and were finally able to find a time to meet. I asked him a few questions and asked him to move a bit. Now, our perception of movement changes when pain is present. What he thought he was doing was different than the reality of it. I helped guide him to motions he hasn’t done in over a month. I gave him permission to move again. This permission does not come from a place of power. It comes from a place of safety and trust. He moved to end-ranges. Then came the big test. To do the one task that caused him pain. He was hesitant but willing. He tried it. Minor pain. He tried it again. Less pain. He tried for a bit longer. No pain. He seemed slightly confused and almost apologetic. An almost, "I swear this was crushing my soul the other day, I promise it was really really really bad type of look." He even said, "I wasn't making this up." Of course, he wasn't. The difference between my approach with Mary and my parent's friend is a culmination of many mistakes and the evolution of thinking. I became less concerned about my ability to fix people, and much more focused on my ability to connect with them. 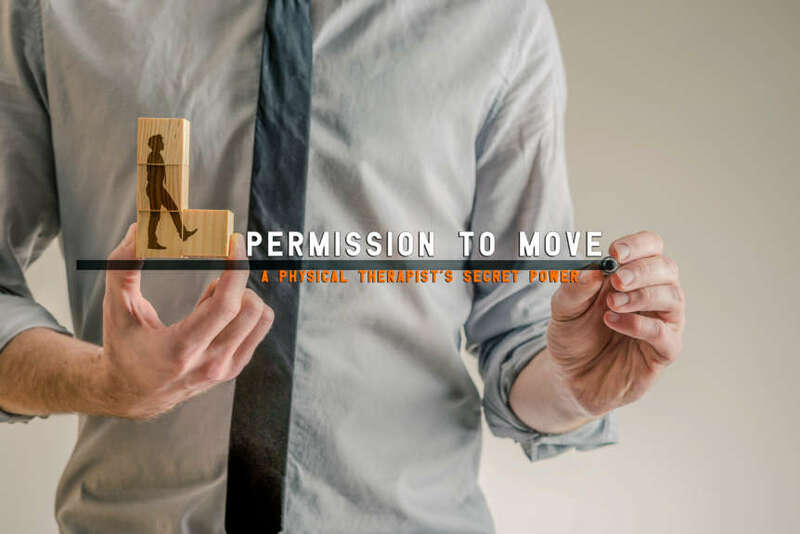 I realized that as a physical therapist, the best thing I can offer people is permission to move. To help them discover the control that they lost. Empowering others creates a relationship based on trust. And starts with simple permission to move. Leave us a comment on Facebook, tag @therapyinsiders or @updocmedia on twitter.